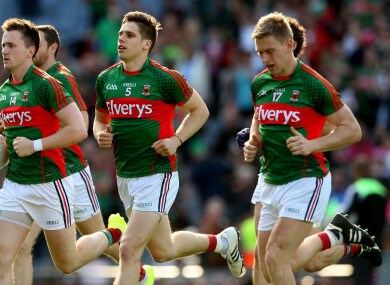 Mayo welcome the All-Ireland champions to Castlebar on Saturday night. MAYO MANAGER STEPHEN Rochford could be without as many as nine of last year’s All-Ireland Final team for the visit of All-Ireland champions Dublin to Castlebar on Saturday night. Defenders Brendan Harrison and Paddy Durcan have joined a lengthy injury list as the Westerners plan for a massive National League game against the Division 1 table-toppers. All Star defender Harrison is rated as ‘a major doubt’ for the All-Ireland Final rematch due to a hip problem while the in-form Durcan is considered ‘doubtful’ due to a leg injury. Rochford is already planning without experienced defenders Chris Barrett, Donie Vaughan and Keith Higgins, while 2017 skipper Cillian O’Connor is suspended for Saturday’s game. Lee Keegan, Tom Parsons and Seamie O’Shea have also only recently returned to training. Keegan is understood to be making a rapid recovery after surgical procedures on both of his hips last November, but the 2016 Footballer of the Year may not be ready to return to competitive action until next month. Higgins, meanwhile, is currently on an extended break from the football squad and is instead lining out with the Mayo hurlers in Division 2B of the National League. The four-time All-Star football defender scored five points for the hurlers from full-forward against Derry at Celtic Park last Sunday. It also remains to be seen whether first-choice midfielders Tom Parsons or Seamie O’Shea will return to Mayo’s match-day squad next weekend. Neither of them have played yet this year with Parsons out of the country on his honeymoon last month, and O’Shea recovering from a knee injury. However, current Footballer of the Year Andy Moran will be available for selection against the Metropolitans after missing the defeat to Galway due to a family bereavement. Mayo, who haven’t beaten Dublin since the 2012 All-Ireland SFC semi-final, are bidding to avoid their third straight league defeat next weekend after recent losses against Kerry and Galway. Meanwhile, a number of players were released from Mayo’s extended panel recently, including experienced defender Kevin Keane and 2016 All-Ireland under-21 winners Brian Reape and Michael Plunkett. Email “Up to 9 Mayo men absent for Dublin showdown as experienced Keane released from panel”. Feedback on “Up to 9 Mayo men absent for Dublin showdown as experienced Keane released from panel”.